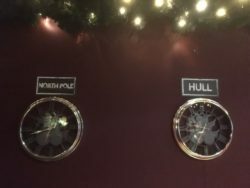 Princes Quay Shopping Centre in Hull always put on a really good grotto, we’ve visited every year since by eldest was one. 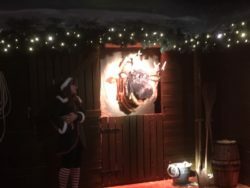 They kindly asked me and my kids (age 4 and 7 now) to go down and have a look around ‘Santa’s Stable’ this week before its grand opening on Sunday 18th November, both me and my kids were very impressed. This year the grotto is on Level 2; just travelling up the escalator excited my youngest as you follow the centre’s Christmas decorations, a Santa’s sleigh and reindeer, upwards as you approach the grotto. The grotto is themed around the reindeer’s stables and we were met by very friendly elves at the entrance. First you go through to the stables area and meet Jingles the reindeer (Jingles is an animated reindeer but a very endearing and funny one!). There are some stories and songs to join in with from Jingles and the elf. Then you move through to another room to do some children’s crafts. 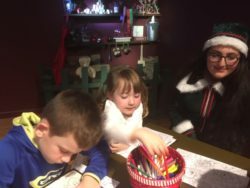 The décor is very festive and magical and my children became engrossed in an activity sheet and colouring a Christmas tree decoration. Then it was through to meet the big man himself. 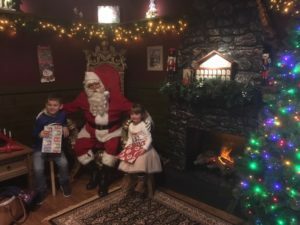 I was very impressed with the Santa, he was very realistic and great with both of my children, even my very shy 4 year old was chatting away to him by the end of the visit. His room is lovely with a gorgeous tree and fireplace. We had a photo taken with him, received a gift and my kids left absolutely buzzing about their time with Santa. As always with Princes Quay, it’s not just meeting Santa in a grotto, it’s a full experience. My kids were chatting about Jingles on the way home and singing Christmas songs, it really did put us all in the festive spirit. The only slight issue this year occurred when we got home and my 7 year old son dropped what I am referring to as the S bomb! He told his little sister that the man we had just met was not the real Santa. I started to panic, he’s nearly 8 and had already informed me earlier that week that there was a rumour going around the playground that Santa is made up. Thankfully he then explained to his little sister that Santa is so busy at the moment that he couldn’t possibly get to all the grotto’s to collect all the Christmas lists, so he hires lots of extra Santa’s to help and that was who we had just met. He said this Helper Santa would be going back to the North Pole to give their Christmas lists to the Santa Boss who would then be the one coming to our house on Christmas Eve. Obviously! 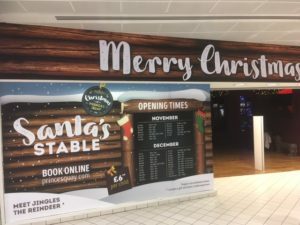 Santa’s Stable opens on Sunday 18th November following the Santa Parade through Hull City Centre (more details about that here), and he is then in residence until the 24th December. The full experience including Santa visit and a gift costs £6 per child, booking online is strongly recommended. For more info and to book tickets in advance please visit their website here.